London mayor Ken Livingstone has pledged his support for a statue of Nelson Mandela to be built at the scene of numerous anti-apartheid protests. 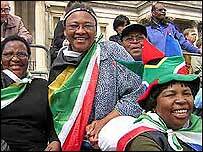 Mr Livingstone was speaking to a crowd gathered in London's Trafalgar Square celebrating the 10th anniversary of democracy in South Africa. He shared the stage with Archbishop Desmond Tutu, a major figure in the anti-apartheid struggle. The mayor told the crowd: "It will be a square of two Nelsons. "The man up there [Admiral Nelson], his battle of Trafalgar was the defining battle that paved the way for 100 years of British empire, and Nelson Mandela looking down on this square will symbolise the peaceful transition to a world without empires." Mr Livingstone said he would appeal to the home secretary if Westminster City Council did not give planning consent for the Mandela statue. Prime Minister Tony Blair earlier signed a special book of tributes marking the 10th anniversary of democracy in South Africa. 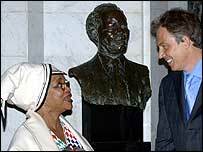 Mr Blair was greeted by South African High Commissioner Dr Lindiwe Mabuza when he arrived at South Africa House in Trafalgar Square. He wrote: "To our friends in South Africa whose courage, determination and integrity inspired and still inspire us all. Tony Blair." Archbishop Tutu later told the cheering crowd in the square: "We are free. We are free. "Friends, you helped us to be free. That may have been the easier part of our struggle. "Now the tough part comes - to make of that freedom a reality for all our people so we ask you: don't leave us." Tory leader Michael Howard and Liberal Democrat leader Charles Kennedy also made separate visits to South Africa House this morning to sign the tributes book. Hundreds of people attended Freedom Day in Trafalgar Square. The event was held 10 years after South Africa's first democratic elections swept the African National Congress Party to power.